Housekeeping: Due to present and upcoming time constraints, the rest of the posts for this week, if I intend to publish them on schedule, will have to be quite a good deal shorter than perhaps was originally intended. A Reminder: In case you are reading this series starting at this post, please note that in an earlier post, I established that there exists (in my opinion, at any rate) a distinction between non-vaccinators, that is, people who for various reasons have opted not to vaccinate themselves or their children against infectious disease, and anti-vaccinationists, who actively work to discourage others from vaccinating themselves or their children and/or even abolish mass vaccination policies established by governmental bodies. It is this latter group, who are campaigning to abolish one of the triumphs of medicine and health policy, that I wish to criticize. The anti-vaccine movement, as an aggregate, tends to make use of double standards when arguing about the evidence regarding vaccine safety & efficacy, the people who recommend them when compared to the people who denounce them, and the people who manufacture them compared to the people who profit from anti-vaccination sentiment. In my post for Day 1 of this "Awareness" Week (quotation marks here used for scare quotes), I explain that vaccines, like any medical intervention, are not 100% risk-free and provide some of the numbers from Canadian and WHO agencies. The risks of adverse effects, based on the available data, are low enough that we can generally conclude that vaccines are safe, compared to other medical interventions, or indeed, to many commonplace life situations. 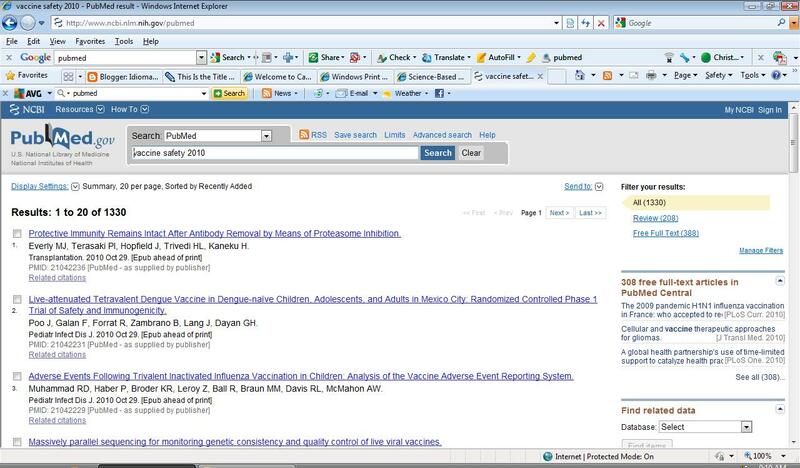 I did a search on Pubmed, the US National Institute of Health catalogue of biomedical literature. My search term was the phrase "vaccine safety 2010". As of 9:07 AM on Wednesday, November 3rd, I got 1,330 hits (screenshot below). I invite readers to attempt similar searches on later times of the day and later days and see what they get. Screen capture as of 9:07 AM, November 3, 2010. 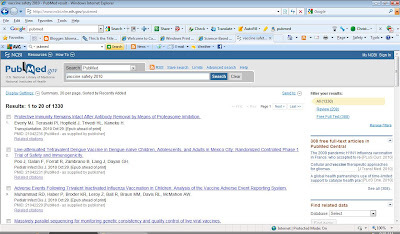 Note the total number of hits for "vaccine safety 2010". Just this year alone, so it seems, there has been a lot of research on vaccine safety. To be sure, not all the hits relate specifically to ongoing research on the safety of currently-used vaccines (I saw at least two in the first twenty that weren't). Suffice to say, even though vaccines are generally a safe medical intervention, research is ongoing on how to make them even safer. No amount of research, whatever the quality, showing vaccines are safe (given the limitations on safety I mentioned on Monday) constitutes acceptable evidence. Any research, or indeed, any anecdote, whatever the quality, showing a danger to vaccines, is acceptable evidence. Your mileage may vary: not all anti-vaccinationists will adopt that exact evidentiary standard, although even more moderate anti-vaccine activists will apply some sort of evidentiary double standard regarding vaccine safety because, after all, their goal is to discourage or abolish mass vaccination. Certainly it is very rare for anti-vaccinationists not to find at least some anecdotal evidence acceptable or to reject out of hand some evidence of vaccine safety on account of solely its conclusions or funding sources. For example, in today's Science-Based Medicine post, the author (Dr. Steve Novella) describes some of the ongoing research on the safety of pertussis vaccines (which presently are components of multivalent diphtheria-pertussis-tetanus vaccines). In the 1980's, current NVIC director Barbara Loe Fisher co-authored a book questioning the safety of the DTP vaccine then in use in the US. The ccurrent vaccines used for pertussis (and friends) are the DTaP (which replaced the DTP) and the Tdap. As described by Dr. Novella, further research, while hinting that while the DTP may have had more minor adverse effects than its replacement, major adverse effects were found to be just as unlikely in either case. Curiously, the NVIC webpage on pertussis still lists Fisher's 1985 book as a reference source on pertussis vaccines, even though the vaccine specifically criticized by the book has been discontinued for use in the United States. Some of the other references described include a link to Mercola.com, and a 2008 book by Fisher on autism and vaccines (more on that tomorrow). NVIC as an institution looks like it attempts to practice something approaching neutrality - on its website, at least. However, it is not always clear that the organization or its director actually have an unbiased view on vaccines. In the linked-to post, Dr Gorski describes some of Barbara Loe Fisher's statements on vaccines, statements that I personally find revealing vis-à-vis her agendum. Particularly telling is the guest list at NVIC conferences. In addition, the NVIC's pertussis page, linked to above, cites dramatic anecdotes by parents on "serious vaccine reaction symptoms" (here I am using quotation marks to directly cite the NVIC site, not as scare quotes). I will shortly summarize the weakness of relying on anecdotes as evidence. As I pointed out on Monday, vaccines are not 100% effective in providing immunity to infectious diseases. The Public Health Agency of Canada estimates 10-15% of people over time do not build up immunity from any given vaccine (although I expect it is very rare for otherwise healthy people to fail to develop immunity from every vaccine they get). However, the efficacy of vaccines seems pretty hard to deny. 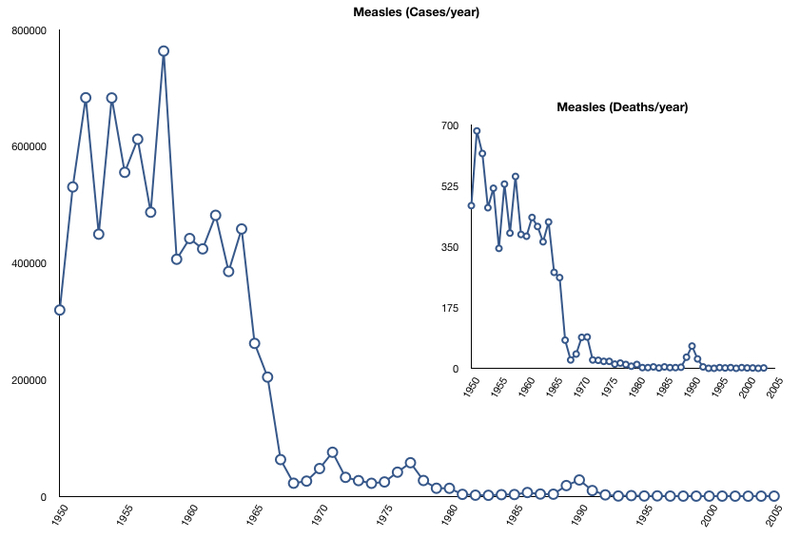 The effectiveness of vaccinia inoculation against smallpox (for that matter, the eradication of wild smallpox), or graphs like this (you get three guesses as to when the measles vaccine was introduced, and the first two don't count) are pretty suggestive of the efficacy of vaccines, even if not everyone who gets vaccinated successfully develops an immune response. However, anti-vaccinationists are not content to let vaccines have their day in the sun. Consider this article on the anti-vaccine blog Age of Autism (if you read enough content on AoA, you will find that its advocacy for people on the autism spectrum and their families are largely outweighed by anti-vaccine activism). It is VERY important to keep close track of these outbreaks and resurgences of once "conquered" diseases because they go directly against the never-proven, pharma-sponsored mythology of vaccine-induced "herd immunity". Once that myth is discredited, their entire house of cards will collapse. - Who really was Edward Jenner? - How was this vaccine manufactured? - Was this vaccine the reason for Smallpox eradication? The vaccine industry story of Smallpox and its vaccine is highly one-sided, if not misleading. What [Bioethicist Arthur] Caplan does not acknowledge, just setting aside efficacy and duration of vaccinations that also come into play, is that any adverse reaction associated with a vaccine will have a higher attributable risk by virtue of the fact that it is recommended for the general population as opposed to specific individuals. What I would like to draw to your attention is that the author supplies no sources whatsoever in support of his arguments. Likewise, the commenters do not provide references to any data (apart from links to documents prepared by a Raymond Obomsawin - which apparently involve outright dishonesty as documented by a surgical oncologist who goes by the blogonym Orac). This is an old website, describing fourteen medical studies which the website claims to analyse and deconstruct. I would try to explain some of the problems with their analysis, but I think I will let Dr Mark Crislip (of Science-Based Medicine) do it for me. The impressive-sounding International Council on Vaccination (when spreading misinformation, it helps to have a nice, authoritative-sounding, "science-Lite" name), formerly known as Medical Voices, has a list of questions they encourage people to ask defenders of vaccination, titled "9 Questions That Stump Every Pro-Vaccine Advocate and Their Claims". Once again, Dr Crislip to the rescue. I hope that the last two segments of this post have made the double standards for evidence (whether of safety or efficacy), as employed by the anti-vaccine movement, clear. Evidence defending the safety or efficacy of vaccines is discounted or rejected on the basis of even the flimsiest of justifications. The Fourteen Studies website not-quite-baldly admits before getting down to its business of ranking studies that the slightest whiff of corporate or government money is enough to invalidate the studies under consideration. Any claim, no matter how weakly it is supported (or indeed, without regard to whether it is supported at all), is acceptable if it attacks vaccine safety or efficacy. Recall the Jake Crosby article: despite being a college student (and therefore, one supposes, trained in the art of academic reference), Crosby does not offer up even one source in support of his assertions. I would also invite the reader to recall my post yesterday, in the section regarding the subversion of scientific research, and review the methodological flaws in the studies upheld by anti-vaccine activists. Incidentally, here is another analysis of Hewitson et al 2009 (which, it transpires, has also been withdrawn from the literature. What shall we say in regard to the anecdotes, the stories, the personal experiences, such as supplied by the NVIC in their parental descriptions of post-vaccination horror stories? First, let me be clear that I do not doubt the sincerity of parents who made those statements. But that does not mean I cannot doubt the veracity of the statements themselves. Whether the described reactions actually correlate temporally with the vaccinations. Whether the described reactions are at all typical (most successful anecdotes are outlier cases and are not representative). Whether any possible medical history or socioeconomic confounders have been taken into account. Whether the recollections actually describe the events they purport to relate to the reader (again this is not to doubt the sincerity of the parents, only the reliability of their memories - remember Hillary Clinton in the 2010 Democrat primaries if you need a refresher on how memories can lead us astray). Whether the recollections are subject to the effects of known cognitive biases. There are, I think, two different double standards at work in vaccine advocacy when considering the way anti-vaccine activists approach the issue. The first is one of qualifications. Put simply, anti-vaccine activists will tend to reject the claims of a participant in the vaccine debate, however qualified he or she may be to comment, on the basis of his or her conclusions (without examining the premises behind them or the evidence supporting these premises) or affiliations. Recall the discussion of Arthur Caplan in the Jake Crosby article. By contrast, anyone taking a position against vaccines will be applauded, regardless of how unqualified they are, how limited their knowledge of immunology or infectious disease is, or how much money they stand to make if the anti-vaccine movement succeeds. I would refer you to my explanation of how anti-vaccine activism can lead to the social phenomenon of levelling down as a support for the above contention, and I will also add some extra reinforcement. The second double standard is one of tone/style/civility. This is a less prevalent double standard. While some anti-vaccine activists condemn the anti-social behaviour that others in the movement occasionally engage in (I again refer you to yesterday's post), others positively encourage it (here's a familiar reference from yesterday). By contrast, when anti-vaccine activists take part in discussions on more scientifically-minded fora, they will occasionally develop rather thin skins. I invite you to examine the contributions of the commenter who goes by the handle 'augustine' on Respectful Insolence. The last example of a double standard I would like to draw to your attention is the standard of profit. Generation Rescue, like the Age of Autism website, is rife with advertisements yet nowhere can I find a statement of any financial conflicts of interest they might have. The double standard is this: vaccine manufacturers making a profit (or even just breaking even) is, apparently unacceptable, even when the product has a proven track record of success and safety, but apparently very acceptable for purveyors of quackery who benefit from vaccine (or germ-theory) denialism, even when their products either have no evidence to back them up, or are contradicted by basic science. If you want an elucidating read on profit, I suggest Filthy Lucre, by Joseph Heath. I hope that I have demonstrated above the double standards that the anti-vaccine movement relies upon to make its case against the evidence of vaccine safety and efficacy, to denounce or discredit advocates of vaccination programmes, and to demonize the manufacturers of vaccines. Tomorrow, in what will probably be a much-abridged post, I will attempt to illuminate the "Anti-Vax Nexus" - the intertwining of anti-vaccine activism and the condition known as autism.